Prickly-Ash. (1) Zanthoxylum americanum Mill. 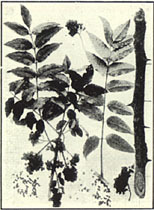 ; (2) Z. clava-herculis L.
(1) Xanthoxylum fraxineum Willd. ; (2) X. carolinianum Lam. ; Fagara clava-herculis (L.) Small. Common prickly-ash, northern prickly-ash, toothache tree, toothache bush, yellowwood, angelica tree, pellitory-bark, suterberry; (2) southern prickly-ash, Hercules-club, toothache tree, yellow Hercules, yellowthorn, yellowwood, yellow prickly-ash, prickly yellowwood, West Indian yellowwood, sea ash, pepperwood, wild orange. The common, or northern, prickly-ash is common in woods, thickets, and along river banks from Virginia, Missouri, and Kansas northward to Canada, while the southern prickly-ash grows along streams from southern Virginia to Florida and west to Texas and Arkansas. (1) The common or northern prickly-ash is generally a shrub from 10 to 12 feet high, rarely exceeding 25 feet. Its leaflets are from 5 to 11 in number and from 1 1/2 to 2 inches long. The greenish-yellow flowers appear about April or May, before the leaves are borne in dense, stemless clusters from the axils of the branches. The branches have brown, cone-shaped prickles, and the bark, leaves, and pods are highly aromatic. (2) The southern prickly-ash is taller than the northern species, but seldom attains a greater height than 45 feet. Its leaves consist of 5 to 17 leaflets from 1 1/2 to 3 inches long, and its small, greenish flowers appear in June after the leaves are out, borne in large clusters at the ends of the branches. The entire tree is furnished with sharp spines or prickles. The bark of both species. prev: Pokeberry. Phytolacca americana L.
next: Prickly Lettuce. Lactuca scariola L.